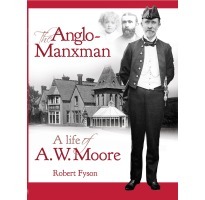 A NEW BIOGRAPHY of one of the greats of Manx history, A W Moore. Although he died at the early age of 56, Moore was a lifelong whirlwind of energy. Born in 1853, the heir to Mooreâ€™s sailcloth works at Tromode and to the grand house of Cronkbourne, he had extensive connections in Londonâ€™s high society and was educated at Rugby and Cambridge. Itâ€™s this side of his life which has led Robert Fyson to choose the title The Anglo-Manxman, but despite his cosmopolitan background and indefatigable travelling, Moore chose to base his life in the Isle of Man. He became not only Speaker of the House of Keys but also an extraordinarily prolific author on Manx subjects, and was involved in numerous aspects of local life. As well as history he wrote on Manx folklore, climate, archaeology, place names, ballads and music as well as producing an Anglo-Manx dictionary, and a history of the Isle of Man Steam Packet Company. Meanwhile his travels took him frequently to Europe, and as far afield as Egypt and the Holy Land in the east and the USA, Canada, Mexico and the Caribbean in the west.